It's always difficult to prioritize lists that are longer than 3-5 elements because it's just too much data for most people to process. I've struggled with this problem in several forms over the years, from choosing a job offer out of college to ranking my direct reports to prioritizing feature requests for a software product. Somebody along the way figured out that if you ask people to just decide the priority of two choices multiple times then you can calculate the relative priority of an entire list... it's called "Paired Comparison Analysis". I remember seeing this approach when we took my firstborn to get his baby pictures. They take over a hundred digital pictures of your kid and then display them on a big flatscreen and you are supposed to pick five. Getting down to about 10 is pretty easy (eyes closed, screaming, etc), but choosing those final 5 from the 10 is actually really difficult. So they pull up just two pictures at a time and ask you to choose between the two. They repeat this many times until your 5 become obvious. The efficiency of this approach is brilliant because the faster the parents choose, the more customers the studio can serve. While the photo studio example is purely binary, a more sophisticated variant allows me to specify degree (e.g. I like this one twice as much as that one). This is overkill for some use-cases but can be valuable in more complex situations. I found some tools to enable this, but they required me to manually compute the score for each of the elements manually. Being a techie I found this to be just silly. I built a spreadsheet which automatically calculate the scores for each element. Each element is listed down the left-hand side and repeated along the top. The bottom triangle of the grid is blanked out to avoid duplicate comparisons. 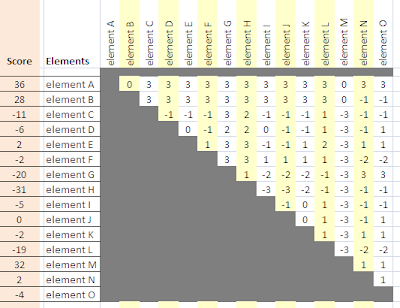 When the element on the left is better than the element on top you enter a positive number in the grid. When the element on top is better you enter a negative number. You could use the same spreadsheet to do simple binary comparisons just using the values one and negative one. If you feel that the comparison is a tie just enter zero. The scores for each element are displayed on the far left. Once you have completed scoring just sort the spreadsheet by the score. If you'd like to try it for yourself you can download my spreadsheet here.